Objective To review the literature on the association between antidiabetic agents and morbidity and mortality in people with heart failure and diabetes. 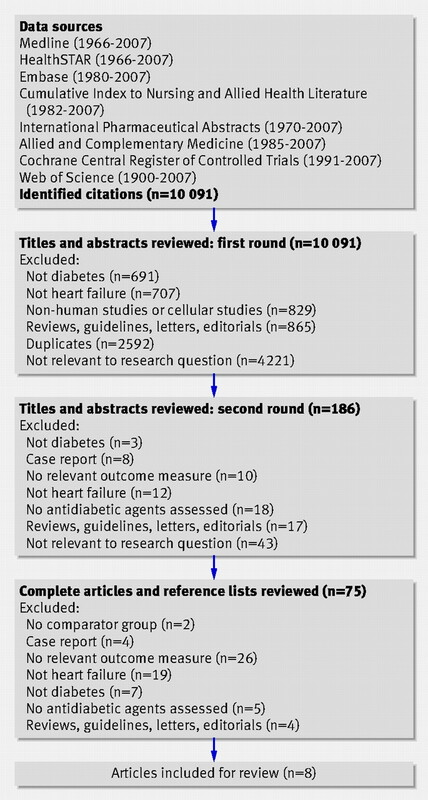 Design Systematic review and meta-analysis of controlled studies (randomised trials or cohort studies) evaluating antidiabetic agents and outcomes (death and admission to hospital) in patients with heart failure and diabetes. Data sources Electronic databases, manual reference search, and contact with investigators. Review methods Two reviewers independently extracted data. Risk estimates for specific treatments were abstracted and pooled estimates derived by meta-analysis where appropriate. Results Eight studies were included. Three of four studies found that insulin use was associated with increased risk for all cause mortality (odds ratio 1.25, 95% confidence interval 1.03 to 1.51; 3.42, 1.40 to 8.37 in studies that did not adjust for diet and antidiabetic drugs; hazard ratio 1.66, 1.20 to 2.31; 0.96, 0.88 to 1.05 in the studies that did). Metformin was associated with significantly reduced all cause mortality in two studies (hazard ratio 0.86, 0.78 to 0.97) compared with other antidiabetic drugs and insulin; 0.70, 0.54 to 0.91 compared with sulfonylureas); a similar trend was seen in a third. Metformin was not associated with increased hospital admission for any cause or for heart failure specifically. In four studies, use of thiazolidinediones was associated with reduced all cause mortality (pooled odds ratio 0.83, 0.71 to 0.97, I2=52%, P=0.02). Thiazolidinediones were associated with increased risk of hospital admission for heart failure (pooled odds ratio 1.13 (1.04 to 1.22), I2=0%, P=0.004). The two studies of sulfonylureas had conflicting results, probably because of differences in comparator treatments. Important limitations were noted in all studies. Conclusion Metformin was the only antidiabetic agent not associated with harm in patients with heart failure and diabetes. It was associated with reduced all cause mortality in two of the three studies. How best to achieve glycaemic control in patients with diabetes and heart failure is therefore an important clinical question. Many antidiabetic drugs are now available to control hyperglycaemia. However, their role in managing diabetes in patients with heart failure is uncertain,17 and considerable controversy exists about the overall effect of antidiabetic agents on outcomes in people with comorbid diabetes and heart failure.w1 w2 Even the level of optimal glucose control in patients with diabetes and heart failure remains uncertain, and some evidence suggests that tight glycaemic control (glycated haemoglobin ≤7%) may be associated with worse survival than less tight control in patients with heart failure, irrespective of the agent used.18 As a result, outcomes are possibly affected not only by the choice of antidiabetic agent, but also by the degree of glycaemic control achieved with the agent. Because of the lack of evidence around these matters, current recommendations are based on pathophysiological rationale, clinical experience, and expert consensus. A better understanding of the effects of antidiabetic agents on the health of people with heart failure and diabetes is needed.17 Thus, we conducted a systematic review to examine the relation between antidiabetic treatment and outcomes in people with heart failure and diabetes. We used a comprehensive search strategy of various electronic databases (Medline (1966-2007), HealthSTAR (1966-2007), Embase (1980-2007), Cumulative Index to Nursing and Allied Health Literature (1982-2007), International Pharmaceutical Abstracts (1970-2007), Allied and Complementary Medicine (1985-2007), Cochrane Central Register of Controlled Trials (1991-2007), and the Web of Science (1900-2007)) from their date of inception until the week of 16 July 2007 for studies with contemporaneous comparison groups (such as randomised controlled trials or cohort studies) that evaluated the association between antidiabetic agents and clinical outcomes of hospital admission or mortality (or both) in patients with diabetes and heart failure (appendix on www.achord.ca). In addition, we also manually searched reference lists from original studies and review articles and contacted experts and authors of included studies. The search was not restricted by language or quality of study. We did not assess the risk of developing heart failure associated with antidiabetic drugs. To summarise the effects of antidiabetic drugs on outcomes of interest (all cause mortality or hospital admission), we abstracted the risk estimates and 95% confidence intervals from each study. For studies with insufficient information, we contacted the primary study authors to acquire and verify data where possible. If appropriate, we then pooled data across studies using random effects models if excessive statistical heterogeneity did not exist (measured using the I2 statistic and defined a priori as P≤0.10 or I2≥50%).21 We used Cochrane Review Manager 4.2 for all analyses. Our search yielded 10 091 citations, and eight studies met our inclusion criteria—one randomised controlled trial, two post hoc subgroup analyses from randomised trials, four retrospective cohort studies, and one prospective cohort study (fig 1⇓).w1-w8 Interobserver agreement was κ=0.84 for study inclusion. Of the eight studies, three had more than two comparison groups. As a result, four studies evaluated the effect of insulin treatment in patients with heart failure (n=9104), three examined metformin (n=3327), four evaluated thiazolidinediones (n=3409), and two studies (n=8918) compared sulfonylureas with other agents. No studies specifically evaluated the effects of alpha glucosidase inhibitors (such as acarbose and meglitol) or non-sulfonylurea insulin secretagogues (such as repaglinide and nateglinide) in patients with heart failure. The box and table 1⇓ summarise the eight studies and their key findings. Overall, the studies were of acceptable quality, with a methodological quality score ranging from 13 (41%) to 22 (69%) (box); the median quality score was 16 (50%). Table 2⇓ summarises the statistical heterogeneity of the studies. A formal meta-analysis was not performed for the effects of insulin or metformin on all cause mortality because of significant statistical heterogeneity. With respect to hospital admission, meta-analyses could only be interpreted for the effects of metformin on all cause hospital admission and thiazolidinediones on hospital admission for heart failure (table 2⇓). Outcomes with insulin were evaluated in a subgroup analysis of 496 patients with diabetes and left ventricular dysfunction (ejection fraction <40% after acute myocardial infarction) from the survival and ventricular enlargement (SAVE) trial (box).w6 After multivariate adjustment, compared with 328 patients not treated with insulin (but treated with diet, sulfonylurea, or metformin), the 168 patients treated with insulin had significantly increased risk of all cause mortality (adjusted hazard ratio 1.66, 95% confidence interval 1.20 to 2.31), and cardiovascular morbidity (hospital admission for heart failure or prescription of an open label angiotensin converting enzyme inhibitor, or myocardial infarction) and mortality (1.38, 1.06 to 1.80; table 1). Outcomes with insulin were also assessed in 554 consecutive patients referred to a university medical centre for management of heart failure (box).w5 Of these patients, 132 (24%) had diabetes and were prospectively followed for 11.7 months. Although insulin and non-insulin treatments were not directly compared in patients with diabetes, extrapolation from the raw data suggests an unadjusted risk ratio for all cause mortality of 3.42 (1.40 to 8.37) at one year and 2.20 (0.96 to 5.03) at two years (table 1) for patients with diabetes treated with insulin compared with those not treated with insulin. The study of Medicare beneficiaries with diabetes discharged with a primary diagnosis of heart failure also evaluated the effect of metformin on all cause mortality at one year (box).w1 After multivariate adjustment, compared with patients not receiving insulin sensitisers (that is, receiving sulfonylureas, non-sulfonylurea insulin secretagogues, alpha glucosidase inhibitors, or insulin) (n=12 069), all cause mortality was significantly lower in patients treated with metformin (n=1861; 0.86, 0.78 to 0.97), as well as in patients treated both with metformin and thiazolidinediones (n=261; 0.76, 0.58 to 0.99; table 1). In addition, no difference was seen in the risk for all cause hospital readmissions for patients receiving metformin (0.94, 0.89 to 1.01) and a lower risk was seen in patients treated with both metformin and thiazolidinediones (0.82, 0.69 to 0.96; table 1). A lower risk was also seen for metformin users with respect to readmissions related to heart failure (0.92, 0.86 to 0.99) and a trend towards reduction in patients receiving both metformin and thiazolidinediones (0.85, 0.71 to 1.01). In a retrospective analysis using administrative records, another study compared metformin alone, or combined with sulfonylurea, to sulfonylurea monotherapy in 1833 patients with newly treated diabetes and incident heart failure (box).w2 After multivariate adjustment, all cause mortality was significantly lower with metformin monotherapy (0.66, 0.44 to 0.97 at one year; 0.70, 0.54 to 0.91 after 2.5 years), or with combined treatment with metformin-sulfonylurea (0.54, 0.42 to 0.70 at one year; 0.61, 0.52 to 0.72 after 2.5 years; table 1). A reduction in the composite outcome of all cause mortality or hospital admission was also seen at the end of follow-up for the metformin monotherapy group (0.83, 0.70 to 0.99) and for combination therapy (0.86, 0.77 to 0.96; table 1). Both of the studies assessing the effect of metformin on all cause hospital admission at one year were of good methodological quality (box) and yielded similar effect estimates.w1,w2 The pooled effect suggests that treatment with metformin may be associated with reduced all cause hospital admission at one year compared to other treatments (pooled odds ratio 0.85, 0.76 to 0.95; I2=21%; P=0.004; fig 2⇓). In the second Medicare study of patients with diabetes discharged with a primary diagnosis of heart failure, after multivariate adjustment as above (n=12 069), all cause mortality at one year was significantly lower for patients treated with thiazolidinediones (n=2226; 0.87, 0.80 to 0.94; table 1).w1 This study also found no difference in the risk for all cause hospital readmissions for patients receiving thiazolidinediones (1.04, 0.99 to 1.10). However, a small increased risk of readmission for heart failure was seen in patients receiving thiazolidinediones (1.06, 1.00 to 1.12). The only randomised controlled trial evaluated the addition of rosiglitazone (n=110) or placebo (n=114) to existing antidiabetic agents in patients with New York Heart Association class I or II disease (box).w7 Although not a specific end point of the study, after 52 weeks of treatment (compared with placebo) there was a trend towards an increased risk of all cause mortality for rosiglitazone (hazard ratio 1.50, 0.49 to 4.59) and in the proportion of patients with hospital admission for heart failure (relative risk 1.30, 0.35 to 4.82; table 2). A trend towards an increase in all cause mortality or worsening heart failure was also seen (hazards ratio 1.28, 0.51 to 3.21. The pooled effect of the four studies which assessed the effect of thiazolidinediones on all cause mortalityw1 w3 w7 w8 suggests that treatment with thiazolidinediones may be associated with reduced all cause mortality compared with other treatments (pooled odds ratio 0.83, 0.71 to 0.97; I2=52%; P=0.10), although moderate heterogeneity was observed (fig 3⇓). Similarly, the pooled effect on hospital admission for heart failure suggests that thiazolidinediones may be associated with an increased risk of such admission compared with other treatments (1.13; 1.04 to 1.22; I2=0%; P=0.004; fig 4⇓).w1 w3 w7 w8 All studies evaluating treatment with thiazolidinediones were of good methodological quality (box).w1 w3 w7 w8 For all cause mortality, although the size and direction of effect estimates varied among studies, we found no consistent pattern of effect in relation to study quality. Similar effect estimates were seen for all studies regardless of quality with respect to hospital admission for heart failure. Few studies formally evaluated treatment with sulfonylureas as an independent exposure group. In the studies evaluating other oral treatments, however, sulfonylureas were used in about 55% of all patients in the main comparator groups (n≈11 000). As a result, treatment with sulfonylurea was well represented in all of the studies evaluating oral antidiabetic agents included in our review. Apart from the effect of sulfonylureas relative to metformin use already mentioned,w2 only one other study looked at sulfonylureas.w1 After multivariate analysis, no increased risk of mortality at one year was seen for patients receiving sulfonylureas compared with patients receiving other insulin secretagogues, alpha glucosidase inhibitors, metformin, thiazolidinediones, or insulin (0.99; 0.91 to 1.08). Heart failure is a common comorbidity in patients with diabetes. Despite the high morbidity and mortality associated with the disease, our systematic review found few studies that formally compared antidiabetic drugs in this important population. Although several studies have evaluated the incidence of heart failure associated with the use of various antidiabetic agents,3 8 23 24 25 26 our review focused solely on the impact of such treatments in people with comorbid heart failure and diabetes. Of the eight studies included in this review, most studies were observational and there was only one randomised controlled trial, which was not designed to evaluate clinical outcomes. All studies were published in the past two years, and focused on use of insulin, thiazolidinediones, or metformin. Historically, metformin has been considered absolutely contraindicated in patients with heart failure who need drug treatment because of concerns about lactic acidosis. Recently, however, the US Food and Drug Administration has removed the heart failure contraindication from the packaging of metformin (Glucophage and Glucophage XR), although a strong warning for the cautious use of metformin in this population still exists.27 The true prevalence of metformin use in patients with heart failure is not known, but published studies suggest 10-25% of patients receiving metformin have comorbid heart failure.28 29 30 Despite the concerns, our analysis revealed that treatment with metformin may be associated with lower mortality rates, although statistical heterogeneity precluded formal meta-analysis. Furthermore, no study found an increase in adverse events with metformin and the results of both studies that evaluated all cause hospital admissions in metformin users suggested that this drug is associated with a lower rate of all cause hospital admission than other antidiabetic drugs. Only two studies specifically evaluated sulfonylureas as an independent exposure.w1 w2 One study found that sulfonylurea monotherapy may be associated with worse outcomes, w2 whereas the other did not.w1 The discrepancy may partly be due to the comparator groups used in the studies. The first study compared sulfonylurea monotherapy with metformin, which has been shown to be beneficial in all similar studies, while the second compared sulfonylurea exposure (alone or in combination) with treatments that did not specifically include metformin. In the first study, it is not clear whether the risk estimates were a result of an adverse effect of sulfonylureas, a beneficial effect of metformin, or confounding by indication. Although these results are consistent with other studies evaluating sulfonylureas,37 38 39 40 a recent meta-analysis has indicated that these drugs are not associated with an increase in cardiovascular events.41 Given the current controversy surrounding the use of sulfonylureas in patients with pre-existing cardiovascular disease,42 more research is needed to determine the true impact of these drugs in people with diabetes and heart failure. Inherent to any systematic review is the potential for publication or selection bias. Studies that may have evaluated the use of antidiabetic agents in patients with heart failure as part of a stratified or secondary analysis may not have been identified using standard search strategies. However, manual searches and contact with primary authors of the included studies provided no extra articles. Any relevant articles are therefore unlikely to have been missed. Secondly, the included studies were mainly observational and only one study randomised patients to different antidiabetic drugs. As a result, the effects of unmeasured confounding variables could not be fully explored and this may be a limitation of most of the reported studies. Our results suggest that of the current antidiabetic agents, metformin is the only one not associated with any measurable harm in people with diabetes and heart failure and is associated with reduced mortality. Given the large number of people affected with diabetes and heart failure and the fact that this population is expected to increase rapidly, evidence on how to optimally control glycaemic levels in this population is urgently needed. It is therefore imperative that research be undertaken to determine the optimal approach for glycaemic control in patients with heart failure. Ideally, this research should be a randomised controlled trial which includes the use of metformin or thiazolidinedione in patients with heart failure and diabetes. Furthermore, this trial should be aimed at evaluating the effect of these treatments on glycaemic control and its relation to long term outcomes, as well as the effect of these treatments on morbidity and mortality in people with heart failure and diabetes. Contributors: DTE, FAM, DFB, SRM, RTT, and JAJ helped plan and design the study. DTE, DFB, JV, and JAJ collected the data. DTE conducted the statistical analyses. All authors had access to the data and helped interpret the data. DTE wrote the first draft of the paper. All authors reviewed and revised the paper for important intellectual content and approved the version. DTE led the study, is lead author, and is guarantor. Funding: DTE held a doctoral research award with Canadian Institutes for Health Research (CIHR). SRM and FAM are new investigators with CIHR and are population health investigators with the Alberta Heritage Foundation for Medical Research (AHFMR). FAM and RTT hold the Merck Frosst/Aventis chair in patient health management. JAJ holds a Canada Research chair in diabetes health outcomes, is a health scholar supported by AHFMR, and is chair of a new emerging team (NET) grant to the Alliance for Canadian Health Outcomes Research in Diabetes (ACHORD). The ACHORD NET grant is sponsored by the Canadian Diabetes Association, the Heart and Stroke Foundation of Canada, The Kidney Foundation of Canada, the CIHR (Institute of Nutrition, Metabolism and Diabetes) and the CIHR (Institute of Circulatory and Respiratory Health). The study sponsors played no role in study design or conduct; collection, analysis, interpretation of data; writing of the report; or in the decision to submit the paper for publication. Padwal R, Majumdar SR, Johnson JA, Varney J, McAlister FA. A systematic review of drug therapy to delay or prevent type 2 diabetes. Diabetes Care 2005;28:736-44. Kannel WB, Hjortland M, Castelli WP. Role of diabetes in congestive heart failure: the Framingham study. Am J Cardiol 1974;34:29-34. Nichols GA, Hillier TA, Erbey JR, Brown JB. Congestive heart failure in type 2 diabetes: prevalence, incidence, and risk factors. Diabetes Care 2001;24:1614-9. Chae CU, Glynn TJ, Manson JE, Guralnik JM, Taylor JO, Pfeffer MA. Diabetes predicts congestive heart failure risk in the elderly. Circulation 1998;98(suppl I):721. Iribarren C, Karter AJ, Go AS, Ferrara A, Liu JY, Sidney S, et al. Glycemic control and heart failure among adult patients with diabetes. Circulation 2001;103:2668-73. Nichols GA, Koro CE, Gullion CM, Ephross SA, Brown JB. The incidence of congestive heart failure associated with antidiabetic therapies. Diabetes Metab Res Rev 2005;21:51-7. Bell DS. Heart failure: the frequent, forgotten, and often fatal complication of diabetes. Diabetes Care 2003;26:2433-41. Reis SE, Holubkov R, Edmundowicz D, McNamara DM, Zell KA, Detre KM, et al. Treatment of patients admitted to the hospital with congestive heart failure: specialty-related disparities in practice patterns and outcomes. J Am Coll Cardiol 1997;30:733-8. Amato L, Paolisso G, Cacciatore F, Ferrara N, Ferrara P, Canonico S, et al. Congestive heart failure predicts the development of non-insulin-dependent diabetes mellitus in the elderly. The Osservatorio Geriatrico Regione Campania Group. Diabetes Metab 1997;23:213-8. Fonarow GC. Approach to the management of diabetic patients with heart failure: role of thiazolidinediones. Am Heart J 2004;148:551-8. De Groote P, Lamblin N, Mouquet F, Plichon D, McFadden E, Van Belle E, et al. Impact of diabetes mellitus on long-term survival in patients with congestive heart failure. Eur Heart J 2004;25:656-62. Ezekowitz J, McAlister FA, Humphries KH, Norris CM, Tonelli M, Ghali WA, et al. The association among renal insufficiency, pharmacotherapy, and outcomes in 6,427 patients with heart failure and coronary artery disease. J Am Coll Cardiol 2004;44:1587-92. Majumdar SR, McAlister FA, Cree M, Chang WC, Packer M, Armstrong PW. Do evidence-based treatments provide incremental benefits to patients with congestive heart failure already receiving angiotensin-converting enzyme inhibitors? A secondary analysis of one-year outcomes from the assessment of treatment with lisinopril and survival (ATLAS) study. Clin Ther 2004;26:694-703. Held C, Gerstein HC, Yusuf S, Zhao F, Hilbrich L, Anderson C, et al. Glucose levels predict hospitalization for congestive heart failure in patients at high cardiovascular risk. Circulation 2007;115:1334-5. Masoudi FA, Inzucchi SE. Diabetes mellitus and heart failure: epidemiology, mechanisms, and pharmacotherapy. Am J Cardiol 2007;99(4A):113B-32B. Eshaghian S, Horwich TB, Fonarow GC. An unexpected inverse relationship between HbA1c levels and mortality in patients with diabetes and advanced systolic heart failure. Am Heart J 2006;151:91. Downs SH, Black N. The feasibility of creating a checklist for the assessment of the methodological quality both of randomised and non-randomised studies of health care interventions. J Epidemiol Commun Health 1998;52:377-84. Harrison RA, Siminoski K, Vethanayagam D, Majumdar SR. Osteoporosis-related kyphosis and impairments in pulmonary function: a systematic review. J Bone Miner Res 2007;22:447-57. Higgins JPT, Green S, eds. Cochrane handbook for systematic reviews of interventions 4.2.6 (updated September 2006). 2007. www.cochrane.org/resources/handbook/hbook.htm. Pfeffer MA, Swedberg K, Granger CB, Held P, McMurray JJ, Michelson EL, et al. Effects of candesartan on mortality and morbidity in patients with chronic heart failure: the CHARM-Overall programme. Lancet 2003;362:759-66. Karter AJ, Ahmed AT, Liu J, Moffet HH, Parker MM. Pioglitazone initiation and subsequent hospitalization for congestive heart failure. Diabet Med 2005;22:986-93. Maru S, Koch GG, Stender M, Clark D, Gibowski L, Petri H, et al. Antidiabetic drugs and heart failure risk in patients with type 2 diabetes in the UK primary care setting. Diabetes Care 2005;28:20-6. Delea TE, Edelsberg JS, Hagiwara M, Oster G, Phillips LS. Use of thiazolidinediones and risk of heart failure in people with type 2 diabetes: a retrospective cohort study. Diabetes Care 2003;26:2983-9. Food and Drug Administration. Product label approval: metformin. 2006. www.fda.gov/cder/foi/label/2006/020357s030,021202s015lbl.pdf. Masoudi FA, Wang Y, Inzucchi SE, Setaro JF, Havranek EP, Foody JM, et al. Metformin and thiazolidinedione use in Medicare patients with heart failure. JAMA 2003;290:81-5. American Society of Health-System Pharmacists. AHFS drug information. Bethesda, MD: American Society of Health-System Pharmacists, 2004. Dormandy JA, Charbonnel B, Eckland DJ, Erdmann E, Massi-Benedetti M, Moules IK, et al. Secondary prevention of macrovascular events in patients with type 2 diabetes in the PROactive study (prospective pioglitazone clinical trial in macrovascular events): a randomised controlled trial. Lancet 2005;366:1279-89. Gerstein HC, Yusuf S, Bosch J, Pogue J, Sheridan P, Dinccag N, et al. Effect of rosiglitazone on the frequency of diabetes in patients with impaired glucose tolerance or impaired fasting glucose: a randomised controlled trial. Lancet 2006;368:1096-105. Home PD, Pocock SJ, Beck-Nielsen H, Gomis R, Hanefeld M, Jones NP, et al. Rosiglitazone evaluated for cardiovascular outcomes—an interim analysis. N Engl J Med 2007;357:28-38. Yki-Jarvinen H. The PROactive study: some answers, many questions. Lancet 2005;366:1241-2. UK Prospective Diabetes Study Group. Effect of intensive blood-glucose control with metformin on complications in overweight patients with type 2 diabetes (UKPDS 34). Lancet 1998;352:854-65. Johnson JA, Majumdar SR, Simpson SH, Toth EL. Decreased mortality associated with metformin use compared to sulfonylurea monotherapy in type 2 diabetes mellitus. Diabetes Care 2002;25:2244-8. Garratt KN, Brady PA, Hassinger NL, Grill DE, Terzic A, Holmes DR Jr. Sulfonylurea drugs increase early mortality in patients with diabetes mellitus after direct angioplasty for acute myocardial infarction. J Am Coll Cardiol 1999;33:119-24. Gangji AS, Cukierman T, Gerstein HC, Goldsmith CH, Clase CM. A systematic review and meta-analysis of hypoglycemia and cardiovascular events: a comparison of glyburide with other secretagogues and with insulin. Diabetes Care 2007;30:389-94. Simpson SH, Majumdar SR, Tsuyuki RT, Eurich DT, Johnson JA. Dose-response relation between sulfonylurea drugs and mortality in type 2 diabetes mellitus: a population-based cohort study. CMAJ 2006;174:169-74.